Do I need to make an appointment for a free estimate? Appointments for estimates are appreciated but not necessary. During business hours, we always have a qualified staff member ready to provide an estimate free of charge with no obligation. What make of cars do you service? We have serviced all makes and models of cars since 1958.
Who chooses my collision repair shop, me or my insurance company? The right to choose your repair shop is yours. Rely on referrals from your family, friends and coworkers as your first referral source. A high quality collision repair shop will be honest, maintain up-to-date training and certifications, perform quality repairs and offer you a lifetime written warranty. Gustafson Body Shop provides all this and a staff with 17 years average tenure in the business. Get the name of the person(s) driving the other vehicle(s) involved along with their phone number, driver’s license, vehicle license and insurance information. Try to obtain any witnesses name and phone number(s). Note the location, time and date. If you have a camera, take pictures. Also, file a police report. We are in Mundelein, IL on Route 176 just off of Route 45 at 23 W. Maple (also Route 176). My new vehicle has ADAS systems. What does that mean and are you qualified to work on it? ADAS stands for Advanced Driver Assistance Systems, they help the driver be a safer driver. We are at the forefront of the latest technology and repair procedures for ADAS systems. 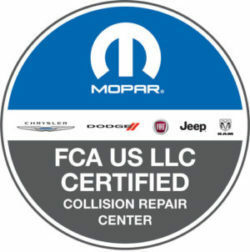 We are certified for a number of manufacturers including Acura, Chrysler, Dodge, Fiat, GM, Honda, Hyundai, Infinity, Jeep, Kia, Nissan, and Ram. I heard new cars today are made from a variety of metal to increase MPG. Are you qualified to work on these cars? That’s a great question. Newer cars are made of a variety of metals to make them lighter. This requires specialized shop equipment and training. We are trained at the highest industry certification, I-Car Gold, to meet the manufacturer’s repair requirements. Will you use factory parts in the repair? We prefer to use factory parts and if you are going through your insurance company, we will work with them to insure they cover your OEM (original equipment manufacturer) parts. If your insurance policy states that you are not covered for OEM parts, then we use our OEM certifications for promotional pricing to get OEM parts for the same price as used or aftermarket parts.